Source for free MSN Messenger emoticons, MSN display pictures, MSN names, MSN winks, animated emoticons & smileys, MSN Icons, Emotions & more! The end of another year is here and it's time to welcome 2012! For this special occasion, you can grab a very special emoticon collection. Use these smileys to send your new year wishes to all your friends and family. Get the free New Year smileys - Click Here! These 2012 emoticons are really cool. You can also browse all of the animated smiley faces in the New Year section. There you can browse them one by one. We really hope you like them and enjoy using them during the holidays! MSN Emoticons: Free animated smileys for Thanksgiving! It's that special time of the year when people just can't stop talking and thinking about Turkeys... yes, Thanksgiving is upon us once again. It just wouldn't be the same without lots of Thanksgiving smileys, so check these out! Get the free Thanksgiving smileys - Click Here! Some of these are absolutely hilarious. You can also browse the animated smiley faces in the Thanksgiving gallery. There you can browse them one by one. We hope you check them out and enjoy using them. It's time for Halloween again... and that means lots of scary and spooky smileys! Check them out and send them to your friends. Download Halloween Smileys - Click Here! If you're after the traditional type, go to our Halloween emoticons page where you can find just about every scary emoticon imaginable! If you want to try something new, we've got some very cool Talking smileys for Halloween which are guaranteed to entertain! The Messenger Backup Wizard has been updated to version 2.2. The Backup Wizard can be used to create a backup copy of your Messenger Emoticons, Avatars, Animations and Display Pics. This new version adds complete support for the new Windows Live Messenger 8.1, and has been fully tested with the latest Live Messenger 8.1.0168. MSN Emoticons: New George Bush Emoticons, Smileys, Icons and MSN Emotions! We've added a brand new collection of free Emoticons featuring George W. Bush! These Smileys talk and are completely animated. They're also Free, so go and check out the George Bush Emoticons and Smileys! The Messenger Backup Wizard has been updated to version 2.1, which fixes a bug that caused any existing files and folders within the select backup destination to be erased. We strongly recommend that users of version 2.0 update to this new version which can be downloaded below. Here is a fresh set of emoticons called MSN Letters. As you can (probably) guess, this pack of free emoticons is based on lots of letters that allow you to use them to create words and text in MSN Messenger or Windows Live Messenger. MSN Emoticons: Messenger Backup Wizard v2.0 - Backup Display Pictures, Emoticons & Backgrounds! One of our most popular Messenger tools, the CE/DP Backup Wizard has been updated to version 2.0. This version will work with the new Windows Live Messenger 8. For those of you not familiar with the tool, the Backup Wizard allows you to save a backup copy of the custom graphics (avatars, icons, etc) that you have added to Messenger. This version also introduces support for automatically zipping your backup. You can save copies of all your MSN smileys, Animated Emoticons, Display Pictures and MSN Backgrounds within a couple of seconds. The Wizard also contains clear instructions and is very simple to use! The Backup Wizard is small (128kb) and requires no installation. Works with MSN Messenger 7, the outdated MSN 6 and the latest Live Messenger 8. 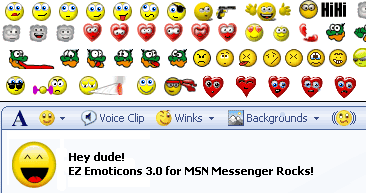 EZ Emoticons 3.0 for MSN Messenger has been released! EZ Emoticons allows you to use emoticons in MSN Messenger without remembering their shortcuts. You simply click on an emoticon and it will be inserted into your message, so you can use hundreds of animated MSN emoticons, MSN Icons, Smileys and MSN Emotions without remembering a single shortcut! Version 3.0 removes the 300 emoticon limit and you can now use unlimited emoticons with EZ Emoticons! An all new design now previews Animated MSN Emoticons along with many other improvements. For more details go to the EZ Emoticons for MSN Messenger Page. EZ Emoticons is compatible with MSN Messenger 7.0 and 7.5, as well as MSN Messenger 6.x. Click Here to download EZ Emoticons for MSN Messenger 6 and 7! EZ Emoticons, the popular MSN Messenger Emoticon add-on that allows you to use all your MSN Emoticons without remembering shortcuts, is now back and better than ever before! It now completely supports MSN Messenger 7 and MSN 7.5, including Animated Emoticons and Large emoticons and much more! Click here to view a full screenshot. Installing and using EZ Emoticons is effortless, you'll have it up and running to use with all your MSN Emoticons, Smileys and MSN Icons in a matter of minutes! For a full list of features and what's new in this release, visit the EZ Emoticons Page, or download some Free MSN Icons. A new pack of Animated MSN Messenger 7 Emoticons is now available from the animated emoticons section. This set of emoticons come in the form of an automatic installer. Emoticons are not animated in this preview. These Emoticons are Cyclops (For example, like Leela) and are all animated (they are not animated in the preview above). + Click here to automatically install these emoticons into your MSN Messenger 7! Want more animated MSN emotions or want to see animated versions of these emoticons? Then drop by the Animated MSN Emoticons section for lots more free animated smileys for MSN Messenger! You can now install lots of cool new animated emoticons for MSN Messenger 7! These animated emoticons are extremely easy to install using our software and you'll have your brand new emoticons installed and ready to use in a matter of seconds! For even more animated MSN Emoticons, visit the Animated MSN Emoticons section. These emoticons are in animated GIF format and are automatically installed, so there is no need for you to insert the GIFs into Messenger one at a time! This is a new set of emoticons for MSN Messeger 6 and 7. The Mega Love collection contains 60 Love Emoticons for MSN Messenger, perfect for Valentine's Day which will be upon us in a short while. Valentine's Day MSN Emoticons - A superb pack of Valentine Emoticons for MSN Messenger that can be used to fill all of your chat conversations with care and love! Here is a new Love Emoticon font for MSN Messenger 7 and 6. You can use these emoticons shaped as letters to write messages in custom emoticons! Valentine's Day MSN Emoticons - A superb pack of Valentine Emoticons and Smileys for MSN Messenger that can be used to fill all of your chat conversations with care and love! Compatible with MSN 7 (and of course MSN Messenger 6).